The service, at Lincoln Cathedral, was ahead of a private funeral for corporal Jonathan Bayliss who died in a jet crash in Wales. Corporal Jonathan Bayliss was killed when the Hawk jet he was in crashed at RAF Valley in Anglesey last month. An ejector seat manufacturer has pleaded not guilty to breaching health and safety regulations following the death of a Red Arrows pilot. The 60-day tour has seen them take in some incredible sights - as captured by the RAF official photographers. 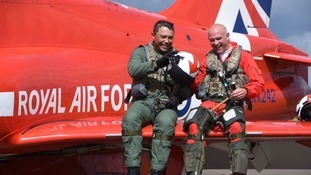 Click in to the article to see the Lincolnshire based RAF Red Arrows fly in to the Gulf state. 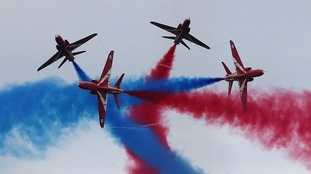 The Red Arrows' summer season in the UK may have come to a close, but the team is still busy training.